Timelessness is the key word, says Carol Kasza. It begins with the light–until you've experienced an Arctic summer, you can't conceive of the abundance of time that 24 hours of daylight gives you. In this remote wilderness, we're free not only from the harried pace of city life, but free from the constraints of time itself. Blessed with natural beauty, from boiling mud pools and spurting geysers to glorious glaciers and stunning waterfalls, or, if you have a passion for scenery, natural beauty and wildlife, there are truly breath-taking scenes to behold on an Arctic cruise: catching a glimpse of whales, manatees or seals, glorious snow-covered mountains, the midnight sun, or maybe a glimpse of the elusive Northern Lights. The highlights of an Arctic cruise might be the stunning Arctic scenery of Qaqortoq or visiting the village of Erik the Red from Narsarsuaq, and are generally centered around Iceland, Spitsbergen or Greenland. There are several different cruise types to this region – firstly the larger cruise ships that visit here are restricted to scenic cruising through the area and generally include a visit to the region with longer cruises to the Norwegian Fjords. Some ships are smaller, they can explore where bigger ships are unable to visit, giving guests a true experience of life in the Arctic – seeing local wildlife in its natural habitat, marvelling at ice-blue glaciers, or enjoying daylight, all day and night. However, other cruises here are expedition style provided by smaller specialty ships that allow passengers to disembark onto remote areas of the Sub Arctic islands, in particular Iceland and Greenland. These ships tend to be sturdy style ships and do not offer all the extras associated with modern cruise ships. These cruises are dedicated to the experience and feature experts in the region and the wild life who give lectures and lead shore excursions. Visits to the Islands are usually by Zodiac inflatables. The High Arctic is best explored in May to September, as the pack ice recedes. Specialty ships generally depart from regional ports. Longyearbyen is the starting point for the voyages to the North and Around Spitsbergen. 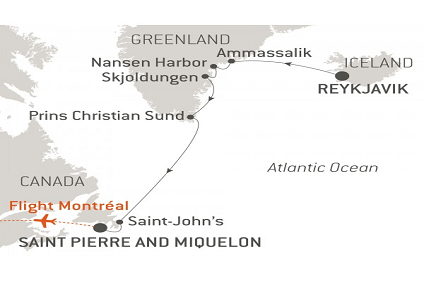 To get to Longyearbyen you will have to fly via Oslo and Tromso. Weather in the sub Antarctic islands is cool but pleasant in the summer months. The nature of the area means that the weather can and does change quite quickly, so if you plan a cruise here take good note of the cruise lines advice on clothing. Again remember that island visits are by zodiac infaltables so you need to ensure you are properly dressed for these trips.